Let’s go deeper into the soil matter. A lot of creatures are living in the soil of our garden. Moles, mice, worms, insects. These once you can see, but there is also live in the soil that you can not see. Microorganisms they are called. And they are large in numbers. These invisible creatures munch the bigger organic matter in the soil into smaller parts. And then in even smaller parts until what is left is a chemical part that can be ‘eaten’ by the plants. Some of it is eaten by the plants and some stays in the organic matter as a buffer for later. Like a pantry. Besides the food for the plants that is produced by the microorganisms in the organic matter, the organic matter contributes to a good soil structure. The soil will be able to contain air and water in a good balance as well. What type of soil you have in your garden will determine what you will be able to grow well. 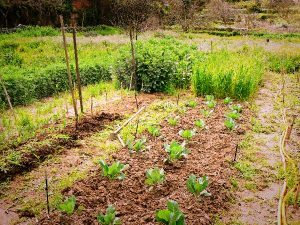 By knowing what kind of soil you have, you will also know how you can improve your soil so you can grow as many different vegetable as possible. Learning about your garden soil is the basis of good gardening. It is very important as you will see as we go along. What acidity your soil has; what type of soil the garden plot has and the amount of nutrition that is available for the plants in the soil. Some plants like potatoes like it more acid, some like peas and bell peppers, like it a bit less acid. Where potatoes can still grow, bell peppers might not. The acidity of the soil influences the amount of nutritions that the plants can take out of the soil. Bell peppers might not be able to get as many nutritions as they need out of the soil when it gets too acidic for them, while at the same acidity potatoes would still do fine. Knowing what acidity the soil in your garden has, means to know what grows well. It is also possible to influence the acidity of the soil by adding something alkaline, like lime. But you need to be very careful with adding lime, because once added too much you can not reverse to getting it more acidic. A lot of plants can not grow on a soil that is too alkaline. So be aware that you can create an irreversible problem by adding too much lime. There might be other reasons why your plant does not want to grow. Check these first before applying lime. How to check your soil will be discussed in the next blog. Acidity is scientifically expressed in pH. The pH scale goes from 0 to 14. A value of 7 is called neutral. That means it is not acid nor alkaline. Values under 7 are called acidic and values over 7 are called alkaline. Pure water has an acidity of 7. Lemon juice, vinegar and rain water are on the acidic side of the scale. Egg white, solved chalk and soap are on the alkaline side. If you want a more scientific explanation of pH click here. This link also tells you something about the history of the term pH. Ever thought about it why it is called pH? You can find a longer list of pH tolerance of plants when you click here (scroll down the page). Why are the potatoes in the link growing at an acidity of 4.8-6.5 and in this blog from 4.2-5.3 ? It might be that the potatoes are from a different variety. Or the soil that functions as a standard is different. The 4.2-5.3 counts for a sandy soil. The 4.8-6.5 might counts for a loamy soil. This is quite a technical story so I will not go there. But be aware that these indications are an indication and not an absolute figure. And that there is always a correction depending on the soil you have. The correction for the sandy soils more to the acidic side and the correction for the clay soils is more on the alkaline side. Roughly soil types are divided amongst clay, sand and silt soils. The clay soils have a very fine structure, the particles are very small. Clay is sticky and greasy when wet. The sand has a more coarse particle then clay, the particles are loose, even when wet. Silt soil is somewhere in between the two. There are three main reasons why you want to know what type of soil you have. The ideal pH for your garden depends on the type of soil. In the description below I will point out the ideal pH per type of soil. 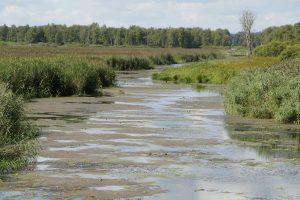 The different type of soils can contain more or less air and/or water. Specific plants can have preferences for a certain type of soil. Clay contains tiny particles that are hard and which compact easily. It is a heavy difficult soil to plant and shovel in. In Holland heavy clay soils are ploughed before the frost, leaving big wet lumps of clay on the fields. The water in the lumps freezes in winter. And because water expands when frozen it breaks the clay. This way the clay becomes workable for agriculture in spring. Potatoes, cabbages and onions are grown on these soils. These soils are not 100% clay, if so they would be you could not work them. Pure clay is the soil that you make pottery from. Clay hold water when soaked. But because the structure is so dense the water will run of very easy when the clay is dry. Clay that dries can crack and it will not hold a lot of air. Clay soils when wet feels a bit greasy and it is sticky. 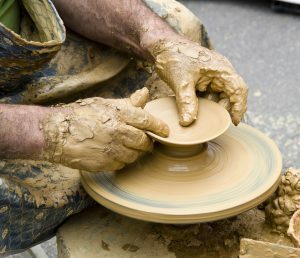 When rolled between the hands the clay forms a role that will not break. Clay is slightly alkaline. The ideal pH to grow vegetables in clay soils is 7.2-7.7 . Sand particles are relatively course. You can see them with the bare eye. There is a lot of air between the particles and it does not compact. It drains the water too well so the water does not stay around the roots of the plants. It does not hold nutrition for the plants. Sand soils need a lot of compost or manure every year because the compost and the manure get washed through the sand with the rain. Roots however can easily find their way in the sand. Carrots, radishes and asparagus grow well in sandy soils. Sand is gritty to the tough. When squeezed it does not stick together at all. Sandy soils are usually slight acidic. The ideal pH to grow vegetables in sand is 5.2-6.5 . 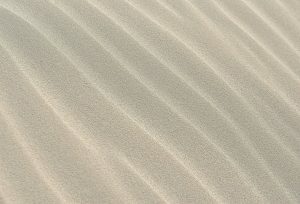 The size of particles of silt are between those of clay and sand. It holds the moisture better than sand. Nutritions are better kept around the plants as well, so it is often fertile. It can still compact easily and is prone to erosion when not well maintained. The ideal pH to grow plants in in silt is 6.7-7.3 . Loam is a mixture of Clay, Sand and Silt. It is easy to work with, holds the moisture and nutritions. This is the best garden soil, I think. It also contains enough air. Another thing that is important to know is: how fertile is your soil? How much nutritions does it have? The main food that plants need are Nitrogen (N); Phosphorus (P) and Potassium (K). Apart from that there are some important spore elements like Magnesium. The plants need Nitrogen for growth, color and density. Phosphorus supports the growth of new roots and shoots. Potassium supports the plants health in general. It also supports stress, disease and cold resistance in plants. All three elements are vital for plant growth. So now that you know all this, how are you going to find out what the soil is like in your vegetable plot? What pH will it have? What type of soil? And will it have enough NPK? For this you need to analyse the soil. In the next blog we will discuss three ways to analyse your soil. 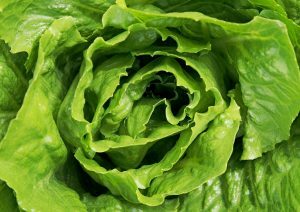 This blog is part of our course: Vegetable gardening for beginners. You want to join the course? Sign up. Hide Vegetable gardening for beginners: what you need to know about soil. Report Vegetable gardening for beginners: what you need to know about soil.